A critical first step is to gather knowledge and ideas from all of us with a passion for improving our future. TEDMED is a community of people who are passionate about imagining the future of health and medicine. Join the conversation on The Great Challenges of Health and Medicine. I’m thrilled to be part of the medical communication team. It’s a privilege to answer your questions. Do you feel communication needs to be improved between doctor and patient? How can we improve communication? Is digital technology improving communication? We would love for you to share your thoughts and ask questions. TEDMED has launched an interactive web site where visitors can learn more about the 20 top Great Challenges, share ideas and comments, and ask questions from health leaders as part of TEDMED’s Great Challenges program. We welcome your input. To submit a question and discuss this challenge with the TEDMED Medical Communications team, please click here. 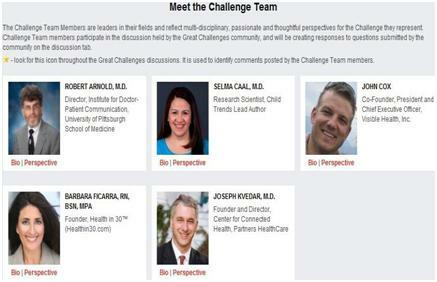 You can follow on Twitter @TEDMED or #greatchallenges.